At Golf Locker we know that fit is important. We’ve created our custom Golf Locker Sizing Guide to help you get your ideal fitting golf shirt and golf pants. We’ve measured all the golf shirts, shorts and pants and in our warehouse, and created fit categories based on each garment’s dimensions. 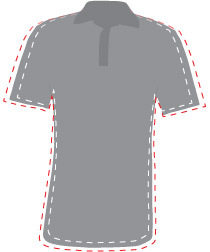 Men's golf shirts are categorized by chest fit and length. Using Nike Victory Golf Shirts as the standard, we've categorized each golf shirt based on how it compares the Nike Dri-Fit Victory Golf Shirts in both the chest and the length. These are the size measurements taken in our warehouse when the golf shirt is laid flat and measured from armpit to armpit. All of the measurements are in inches. These are the size measurements taken in our warehouse when the golf shirt is laid flat and measured from just below the collar to the bottom hem. All of the measurements are in inches. 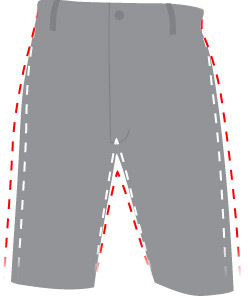 Men's golf pants are categorized by rise and leg opening. Using Nike Flat Front Golf Pants as the standard, we've categorized each pair of golf pants based on how it compares the Nike Flat Front Golf Pants in both the rise and the leg opening. Rise is the distance from the middle of the crotch seam (right between your legs) to the top of the waistband. Pant rise is important because it not only determines where the pants sit on your body, but the amount of fabric and space that’s available. Standard Rise: We base our Standard Rise on the Nike Dri-FIT Flat Front Tech golf pants. Fitting comfortably at your natural waist, these golf pants are ideal for a traditional, classic look. Shorter Rise: Our Shorter Rise features shorter distance from the crotch to the waistline, which provides you with a fit closer to the body - ideal for shorter guys. Extended Rise: Our Extended Rise golf pants are designed to provide longer distance from the crotch to the waistline in order to provide extra room and comfort - ideal for tall guys. These are the size measurements taken in our warehouse when the golf pants are laid flat and measured from the middle of the crotch seam to the top of the waistband. All measurements are in inches. Standard Fit: We base our Standard Fit on the game’s most popular golf pants, the Nike Dri-FIT Flat Front Tech golf pants. These golf pants provide just enough leg room so that they fit nicely without being too tight or too loose. Slim Fit: Our Slim Fit golf pants feature a slightly narrower cut through the thigh and legs for a more modern, tailored look. Loose Fit: Our Loose Fit golf pants are designed with a relaxed cut that provides extra space for easy movement and comfort. These are the size measurements taken in our warehouse when the golf pants are laid flat and measured from 2 inches below the crotch, from the left seam to the right seam across the thigh. All measurements are in inches. Men's golf pants are categorized by rise and leg opening. Using Nike Flat Front Golf Shorts as the standard, we've categorized each pair of golf shorts based on how it compares the Nike Flat Front Golf Shorts in both the rise and the leg opening. Rise is the distance from the middle of the crotch seam (right between your legs) to the top of the waistband. Short rise is important because it not only determines where the shorts sit on your body, but the amount of fabric and space that’s available. Standard Rise: We base our Standard Rise on the game’s most popular golf shorts, the Nike Dri-FIT Flat Front Tech golf shorts. Fitting comfortably at your natural waist, these golf shorts are ideal for a traditional, classic look. Modern Rise: Our Modern Rise features shorter distance from the crotch to the waistline, which provides you with a fit closer to the body - ideal for shorter guys. Extended Rise: Our Extended Rise golf shorts are designed to provide longer distance from the crotch to the waistline in order to provide extra room and comfort - ideal for taller guys. These are the size measurements taken in our warehouse when the golf shorts are laid flat and measured from the middle of the crotch seam to the top of the waistband. All measurements are in inches. Standard Fit: We base our Standard Fit on the Nike Dri-FIT Flat Front Tech golf shorts. Slim Fit: Our Slim Fit golf shorts feature a slightly narrower cut through the thigh and legs for a more modern, tailored look. Great for thin guys who want to avoid a saggy look and could benefit from a little less extra fabric, these golf shorts are ideal if you’re trying to be on-trend. Loose Fit: Our Loose Fit golf shorts are designed with a relaxed cut that provides extra space for easy movement and comfort. These golf shorts are ideal for muscular and/or burly guys who benefit from a roomier feel through the thigh region, while still keeping you looking current. These are the size measurements taken in our warehouse when the golf shorts are laid flat and measured from 2 inches below the crotch, from the left seam to the right seam across the thigh. All measurements are in inches.